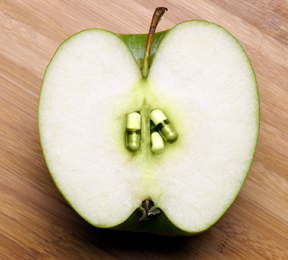 Find out which popular dietary supplements doctors recommend. If you suffer from joint pain due to arthritis, chances are you've taken either over-the-counter or prescription pain relievers, namely non-steroidal anti-inflammatory drugs (NSAIDs). But the risk of stomach ulcers and kidney damage are steering people toward other sources of pain relief, like natural joint supplements. The trick is finding supplements that actually take away your pain, not just your money, says Natalie Azar, MD, a rheumatologist at the Center for Musculoskeletal Care at NYU Langone Medical Center. There's not a lot of hard science behind most supplements, but many people say they help. Here's a breakdown of some popular options. Glucosamine and chondroitin are both precursors to a type of protein called proteoglycans. This protein is the building block for the cartilage that cushions your joints, explains Azar. Glucosamine helps build and repair cartilage, while chondroitin keeps it from breaking down. Most glucosamine and chondroitin supplements come from animal sources. "Supplements claim they can help your body to start building and repairing cartilage on its own, but studies haven't been able to show that," she says. Study findings haven't been consistent about pain relief, either. But results from one of the largest studies examining supplements for osteoarthritis are encouraging. Nearly 1,600 people with knee pain took daily doses of 1,500 mg of glucosamine, 1,200 mg of chondroitin, or both. The supplements didn't delay cartilage loss, but they did provide significant pain relief to people with moderate-to-severe pain. Azar recommends taking both glucosamine (1,500 mg) and chondroitin (1,200 mg) daily. She says these supplements may or may not work, but she also won't argue with the fact that many of her patients feel better taking them, and the supplements do no harm. Long touted for their anti-inflammatory properties, omega-3 fatty acids have been proven to relieve rheumatoid arthritis symptoms, such as joint pain and swelling. A review of 17 studies reported that using omega-3s for three to four months reduced joint pain, stiffness and tenderness in people with rheumatoid arthritis. It also reduced the need for NSAIDs to relieve pain. Another study found that combining omega-3 with glucosamine is even better. Azar says you can also boost your omega-3 intake by eating salmon, krill, flaxseed and walnuts. A newcomer to the pain relief spotlight is magnesium. "It works as a pain reliever and muscle relaxant, and can make you a little sleepy, too," says Azar. She recently began prescribing the mineral to fibromyalgia and arthritis patients at 300 mg in the evening – less than the daily recommended intake (400 mg). Another perk is that magnesium is cheaper than many other supplements. Whatever supplement you choose for joint health, Azar suggests trying it for three months. "If your joints feel better, keep taking it. If not, don't bother." But before you take anything, discuss it with your doctor.